LatinaLista — According to consumer research, 70 percent of people trust brand recommendations from their friends. The same can be said for books too. How many times have we picked up a book — either at the library, book store or online — based on how well someone we knew said they enjoyed it? It was a behavior that Mexicana Pamela Valdés soon realized after she created a Facebook fan page for lovers of books in Spanish, called Beek. When after a few months, she registered over 23,000 fans, she knew she was on to something. She enlisted fellow Latino Max Holzheu from Guatemala, whom she met in Austin, Texas, and together they entered their idea in a contest and won the Startup Battle of #700, a community of Latin American entrepreneurs. Valdés and Holzheu won the opportunity to work out of the Capital Factory, a tech start-up accelerator in Austin. There the business partners were lucky enough to have Bob Metcalfe, the inventor of the Ethernet, take them under his wing and mentor them through the launch of their new business dubbed Beek. Billed as a social network for readers, Beek is free to join, with a quick sign-in via your Facebook page. Once a part of the Beek community, everyone fills out a social profile highlighting your favorite titles, what you’re reading and want to read. Everyone is invited to leave book reviews where fellow “Beekers” can read them and decide which books to add to their virtual library. If a title looks particularly tempting, each book profile on the site has included a buy option from Amazon. However, any book lover knows that a true wordsmith isn’t just in love with an author’s story but with his/her use of words. Beek offers space to share your favorite phrases from books, as well as, your opinions on the story. And in keeping with the spirit of social media, Beekers can follow one another and see what each other is reading. 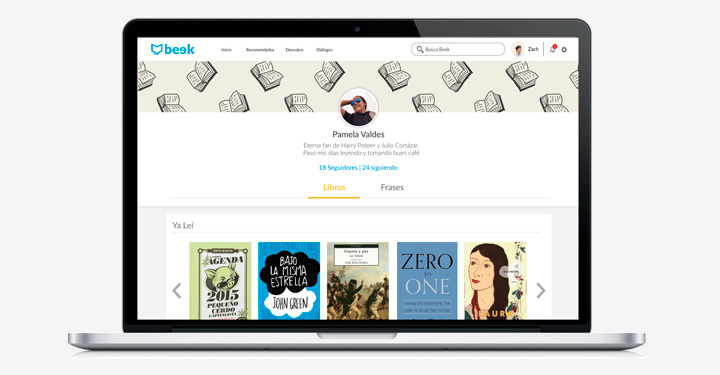 The Beek team is looking into incorporating authors and popular personalities into the platform in such a way that users can have access to their favorite books. Since its launch, Beek has more than 4,200 registered users from 15 countries.